Yesterday afternoon, I did something unusual for me. I went to the pub. Now, I’m no prude. I enjoy going to the pub with a group of friends or colleagues for a meal on occasion. But to just go for a drink – not my thing. Noise, smoke, the smell of beer – definitely not my thing. Actually, to say I went to the pub is not strictly true. We went to a tavern, a big old tavern (by Western Australian standards) with lots of Olde Worlde charm and lovely gardens. There, we sat in the shade of the big Cape Lilac trees, drank cool wine and listened to a man (in a funny medieval costume) playing a Celtic Harp and a Dulcimer – though not at the same time, of course. A small taste of heaven. There was method in my madness. 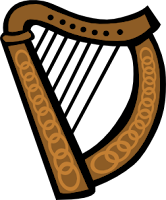 Only days before, I’d been in the local music store to ask a silly question – do you know where I could get a Celtic Harp? I’ve decided that for my fiftieth birthday in a few months, I want to do something I always wanted to do and never did, something that’s a bit of a challenge, but fun.I always wanted to go into space, but I don't think that's an option. So, I’m determined to get a Celtic harp and learn to play it. Celtic harps are not plentiful around here. That’s an understatement, I must add. So I knew the answer before I went into the shop. But he did have a flyer for this chap who would be at the local tavern to launch a new CD on Sunday. It was an opportunity too good to miss. I did manage to corner the musician during the break and ask him where he got his harp. It turns out, it came from America and cost…rather a lot. There’s the cost of the harp, then there’s levers, the case and the shipping on top of that. I’m not good at spending money. I was brought up by very careful parents. But in this case, I think I’ll lock Scrooge out and follow my dream. It’s not every year you turn fifty. Thanks, Rena and Joanne. I have the harp picked out now. I just have to order it - from Canada! Go for it ! Sounds fantastic idea. As for the cost - am sure the family will be quite happy to live on soup for however long it takes to support you ! Its me thats funny. The costume is deadly serious.